Javier and I started talking in November, a month before Sylas’ first birthday, and decided that we would start trying for baby number two. Since we already have a boy, we wanted to see if we couldn’t try for a girl so I went to the internet looking up ways to increase our chances. One of them was being intimate at the beginning of your “fertile window” during your cycle. So that is what we did and that month, unfortunately, was unsuccessful. We talked it over a little bit more and decided that we would just go for it the next time. After all, we really just want a healthy baby and someone for Sylas to grow and play with. We tried in December 2 and 3 days before ovulation. I am one of the lucky (if you can call it that) ones that gets mittelschmerz or ovulation cramps. So on my ovulation day I felt crampy and pretty normal for me. But the next two days, I felt the same way and just over all icky. I wanted so bad to be pregnant but I didn’t want to get my hopes up so I tried taking my mind off of it. I vowed that I would not test until after my missed period because in November I tested and tested and tested and was negative. But anyone that knows me knows that I am not a patient person so this has been hard. I was googling the earliest day to test and what time of day to test and all sorts of things because I was dying to know. This past week, I have somehow converted into an insomniac and have not slept well in days. Thursday night (Jan.2) I was doing my usual routine and watched the news until my eyes started to get heavy and went to bed around 10:30. I didn’t get to sleep for about 20 minutes witch is pretty normal for me. Next thing I know, I’m up at 2 something wide awake! I tossed and turned until I got to a very light snooze and work up again at 4:13. That time I had to get up and walk it off. I went pee and got a drink and climbed back into bed where I tossed and turned for another half hour. Just when I got to a deep sleep I hear my alarm singing to me. 5:30AM and I have to get ready for work. I felt exhausted all day. That was the worst night so far but most of this week I have been tossing and turning off and on. I figured that maybe it was because of New Years and I was having trouble getting back into a sleep pattern. I wasn’t up really late New Years Eve, Javier even woke me to give me a kiss at midnight because I dozed off on the couch. 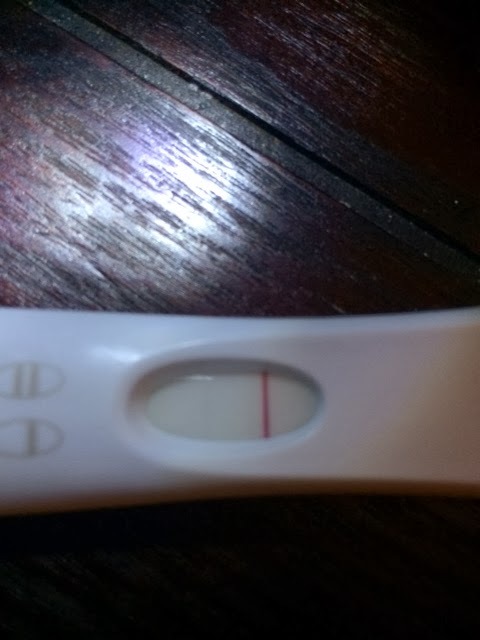 Yesterday (Jan. 4), I was 9DPO and 6 days till my period was supposed to come. I was just so anxious that I couldn’t take it any longer, so I took an EPT brand test. Low and behold it was negative…or so I thought! I jumped into the shower kinda disappointed, but I told myself “See! You knew it was too early!” When I got out, I looked at the test again. There it was, the most faint little pink line you could ever see! I started jumping up and down in nothing but my bath towel and probably looked like a little school girl who just got a text from her crush. I was so happy that it finally happened (well it only took 2 months but when you have no patience, it seems like an eternity)! I wanted to tell Javier right away but he was at work and I wanted to see his reaction. 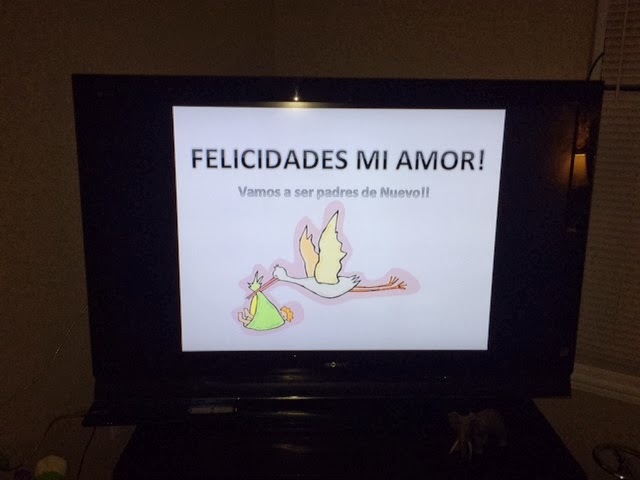 So I made an announcement on the computer and plugged it into the TV so that it would be the first thing he saw when he got home. The first thing he said was “What are you watching?” and then he read it! He said “No way! ?” And looked at me while I had this humongous grin on my face that said it all!So we are Expecting baby number two! I am 3w4d and I am totally thrilled! I am not going to make an appointment right away because they can’t really see much right now anyway. I think it will be close to the end of the month or the first week of February. EEK! I am still getting over the initial excitement!